​Amy, can you please share with us your background before yoga? I was born in Manila, Philippines and am the youngest of four children to two physicians. My family immigrated to the US when I was three years old. I grew up in Jamaica, Queens and Orange County, New York. My higher education was spent at New York University. After graduation, I danced professionally and worked in arts management, mostly touring internationally with American artists (Merce Cunningham, Lucinda Childs, Meredith Monk) and their companies either in an administrative or production capacity. I was very active in that field for about ten years. Throughout that time, I continued to be based in downtown Manhattan, with a couple of brief periods living in France and Germany. What initially led you to practice yoga? Stressful career? Unlike many New Yorkers, I did not come to yoga to relieve stress. The first yoga class I ever took was an offering at a dance studio where I was studying regularly. I tried a class to simply experience something new. I found yoga to be outrageously difficult, but I kept practicing because I could sense that it was changing me in a very important way, a deep way, a way I didn't yet understand. How did you discover the practice? 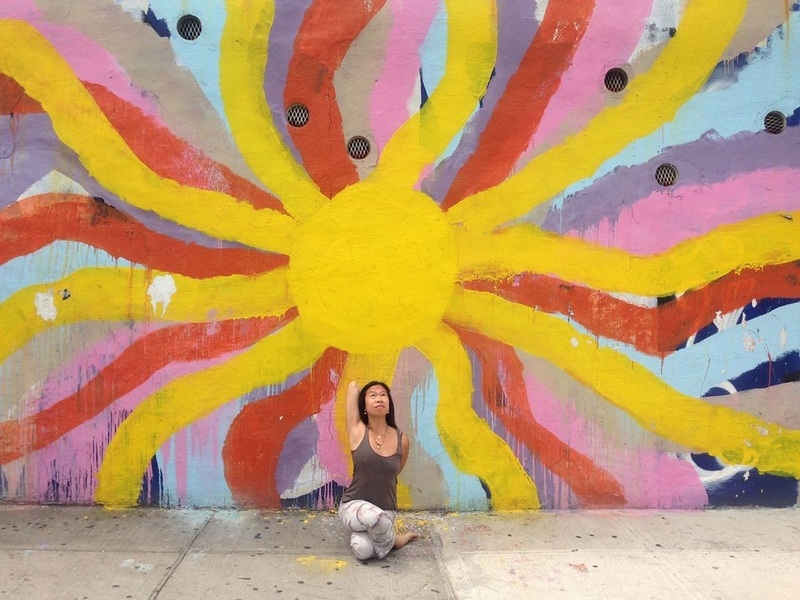 Throughout the first half of my life in New York, I experimented with many yoga methods. In this second half, it has been fully focused on ashtanga. My introduction to ashtanga came from David Life and Sharon Gannon of Jivamukti Yoga. I initially took some led classes at their school, but it wasn't until I began the traditional Mysore style that the power of ashtanga truly revealed itself to me. It was like discovering a secret door in a house that I had been living in for years: a mixture of excitement, fascination, and utter fear. After three months of practice, I was on a plane to Mysore, and one month later, I was wholly dedicated to Guruji and his teachings. That was 1999. After that first trip, I spent the next ten years or so nurturing my practice with Eddie Stern, who has had a profound impact on how I have shaped my life as a student, a teacher, and a yogi living in New York. Amy, can we explore how the Mysore style shifted your ashtanga experience. What exactly about the method captured you? Pretty much everything about the Mysore approach captivated me. It seemed to include elements of everything I had been searching for in a yoga practice. I loved the silent and focused atmosphere, I loved how I could practice at my own pace and listen closely to my body's needs on a daily basis, I loved how every person's unique energy was weaving and spiraling around me. The entire quality of the Mysore style felt so primal and extraordinary; the sacredness of what was being exchanged in that space was very palpable. As a result, every day on the mat felt like I was physically, mentally, and emotionally tuning myself to its highest frequency. As a matter of fact, all those feelings still ring true. Did you find it difficult to leave dance to pursue ashtanga yoga or did you see it as a continuation in studying movement? Completely the latter. However, initially there were quite a number of years that I was still dancing and regularly practicing in tandem. I found that each path informed the other beautifully. I was much more in tune to my breath and the present moment while dancing because of yoga, and I have always felt that my practice was a kind of dance in the form of offering. The actual transition from one to the other was very organic; my ashtanga practice simply became more challenging, and as I got older, I had to adjust what I asked of my body physically. Also, with Guruji's blessing, it seemed like a natural shift to move away from performing and into teaching. I remember very early on asking Guruji what he felt about dance as a companion to yoga. He looked into my eyes and said, "If makes you happy, then dancing good," then he gave me a huge grin. What does parampara mean to you? Parampara means a steadfast, unbroken succession of authentic, undiluted direct teaching. On a deeper level, it necessitates devotion and reverence to the Guru and respect for the community at large. On a personal level, it aspires to follow Guruji's example, i.e. living a life of yoga and teaching from experience, from the heart. I also think learning/teaching in the lineage doesn't necessarily happen only in hierarchy form. I've had many many opportunities to share lessons of the method laterally. What an amazing group of teachers are in our world right now. I feel very lucky to be part of such a devoted network, going through similar daily struggles and victories of teaching the practice while developing their own. My colleagues constantly counsel, inspire, and energize me. And foremost, I learn from my wonderful students; every day together we practice humility, acceptance, compassion, courage. They've opened my eyes to how truly universal ashtanga can be. Can you share with us your experience as a student of Sharath? How has it influenced your own style of teaching? Sharathji has been a steady calming presence for me since the very beginning of my time with ashtanga. He is such an inspiration in his total commitment to Guruji and the wonder and dedication he has for this practice. I have always clearly felt his support for me as a teacher and through all the stages of my adult life; I trust him implicitly. This trust is paramount in a system such as ours, not just because of the vulnerable places we enter into while learning the challenging physical postures, but also because of that parampara we spoke about earlier. The depth and strength of the student-teacher relationship directly translate to a true understanding of all eight limbs of ashtanga yoga. The thing I probably appreciate the most about Sharath is his sense of humor. I literally laugh every day I am with him, through our direct interactions and even little things I overhear when he is on the other side of the room talking to another student. Maintaining lightness amidst the intensity helps sustain our energy and makes it possible to practice for a lifetime, as Guruji intended. Sharath has also really taught me about the importance of self care. As any Mysore teacher knows, the work we do can be both physically and emotionally grueling. Sharath has shown me how to manage my time and energy while teaching for hours on end, and still have something left for all the other aspects of my day and into the next. The last thing I want to mention is his constant reference to one word: Research. 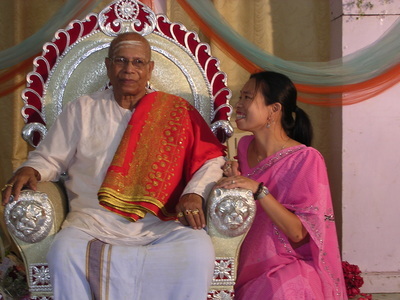 When Guruji was still with us, the yoga shala in Mysore was named the Ashtanga Yoga Research Institute. Oftentimes when a student asks Sharath a question, for example, "How are you able to get people into Marichyasana D so easily," or "Why are you the only teacher who can help me catch in backbending," his answer is a smile and that word, "Research." The almost siddhi-like quality he has of being such a gifted teacher comes from decades of experience, with a nice sized helping of Guruji’s grace. It’s simple, really. Success in teaching is born from the daily act of teaching. Success in practice is born from the daily act of practicing. Success in life is born from the daily act of living. How as a Mysore teacher do you help students with the emotional issues that may arise from practice? Ultimately, as in everything within the context of a Mysore environment, that needs to be addressed on a case by case basis. Everyone expresses and deals with emotions differently. In general, I really try to assure my students that they can talk to me; whether it be about roadblocks in their practice (in body and mind) and/or feedback about my teaching. Because the Mysore room is so inherently quiet, I find that most students are a little shy to speak up when they need something. It's important to keep the lines of communication open, and sometimes that does delve into emotional territory. One thing that seems to universally help everyone is the breath. A steady, free breath is like a soothing balm on the mind. Many practice too quickly (especially here in NYC, where there never seems to be enough time), and I am always reminding my students to take deeper, slower breaths. A shallow breath is a sign of an agitated mind, which is often a result of some sort of emotional breach. 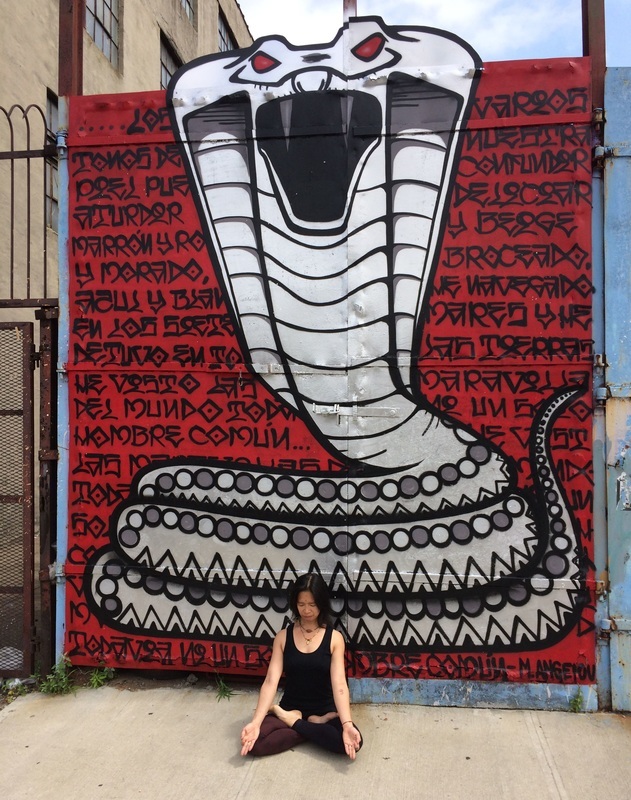 In my own experience, I began my ashtanga practice when I was in a hyper emotional state after an intense personal crisis, one which led me to seriously question my self worth. In the beginning of my healing phase I used yoga to expend energy to the point of physical exhaustion, to the point I could not feel anything. The numbness combined with the natural high helped me to cope. Then when I started Mysore, my first big breakthrough to a clearer understanding of yoga happened while learning navasana. (Lots of suffering in the beginning…!) One of my first teachers, Chris Buhner, instructed me to stop my practice there: "Do less until you can breathe correctly." The benefit immediately became clear: instead of feeling depleted after practice, I felt relaxed and restored. 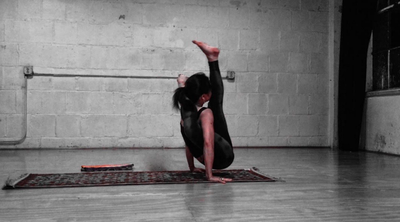 I grew to love ashtanga, and consequently, learned to love myself again. The breath was the gateway to that progress and revelation. Does being a Mysore teacher inspire you to practice yoga beyond the yoga mat and shala? I think it's impossible not to do this, certainly with regard to the ashtanga yoga method, whether one is a teacher and/or a student. When you reach a certain level of comprehension as to what the eight limbs of yoga entail, it becomes very apparent how the asana and pranayama elements to practice are just a couple of links in the long chain to yogic fulfillment. It’s all about integration and balance. Honestly I think many would agree that the greatest evidence of the existence of yoga happens off the mat. Ashtanga for me (and so many others) has been a true game changer. I find myself making all my lifestyle decisions based on their benefit to my ashtanga practice: what to express, when to sleep, how to eat, what to study, with whom to spend my time. The practice seems to seep into everything I do. When you practice ashtanga yoga, you learn that every breath you take is significant. When you step off the mat, the breath continues, so on the deepest most meaningful level, the mind should become perpetually focused on yoga in every action. Do you have any final thoughts, Amy? I would just like to strongly encourage anyone out there who is interested in ashtanga to open their minds and hearts to the practice and take ample time to explore it. The gifts that can be received from it are vast and numerous. I began the practice with little strength, little patience, and little faith. Now I think it's safe to say I have all of those things, and a peaceful approach to life. Ashtanga has blurred my boundaries and limitations and in many cases, dissolved them completely. The one doctrine Guruji emphasized to me constantly in our time together was "Anything is possible". Realizing this firsthand through yoga has empowered me in a profound way, but at the same time taught me how to surrender completely, to my best self, to Guruji, to allowing myself to be happy. Lastly, I just want to take a moment to thank everyone from this community who over the years has guided and affected me deeply: Guruji, Sharath, Saraswati, the entire Jois family, Eddie Stern, Peter Sanson, my friends in Mysore, and my fellow teachers and practitioners all over the world, especially my students. I'd also like to thank you Lu for giving me the opportunity t_o speak in depth about the practice and tell some of my story. I feel so blessed. Just thinking about it makes me overflow with love and gratitude. Every day of my life is sweeter and more joyful because of ashtanga.